Cornerstone Cabin is an extraordinary cabin. We used three 100 year old square log cabins to build it. The old cabins were tagged, disassembled, moved to the lake, and reassembled into one house under current building codes, with all the modern comforts of home. The lake house sits on 11 secluded, forested acres with no other houses in sight. It has magnificent craftmanship, and all the wood was either from old dwellings or custom-milled for the house. Cornerstone Cabin has a tin roof, making the rain's pitter-patter so soothing. Another unique feature is that it has a full 2nd story. Most cabins constructed with old square logs are 1.5 stories with a loft or knee walls upstairs. Cornerstone has lots of windows & 7 ceiling fans throughout the house so you can throw open the windows & enjoy the fresh air & wildlife sounds. For your sleeping comfort, there are hand-made wooden shutters throughout the house to darken the rooms. Cornerstone's upstairs has 3 spacious bedrooms, 2 of which (queen & twin in each) have cathedral ceilings with exposed rafters. It's awesome to wake up slowly in the morning on vacation & gaze at the rugged old square logs, the old-timey chinking, & beautiful rafters (notched together the old-fashion way). The 3rd bedroom is also spacious & has 2 twin beds. The upstairs bath has full tub and shower. Starting from the ground up, there is stacked-stone foundation, chimney, & fireplace; then 3' X 9' floor joists for the 1st floor (exceeds any building codes, so the house is solid as a rock). The downstairs has custom-milled beams & includes bedroom (king), bathroom with shower, stack washer/dryer, fully-equipped kitchen, indoor seating for 12 with dining room table (6), bar (2), & game table(4), hi-speed internet, & family room with satellite color TV, oversized fireplace, & sturdy antique staircase built in 1820. Opening from both family room and downstairs bedroom is a 10' x 20' aromatic cedar screened porch with ceiling fans and dining table for 6. This is our favorite spot for morning coffee, evening cocktails, and dining. There's a hummingbird feeder right beside the porch, and if you're quiet & still enough, you can enjoy watching them feed in the summertime. Cornerstone Cabin is in a forested, slow-moving world of quiet solitude, wildlife, & no other houses, and yet, incredibly, you are only 10-to-15 minutes away from 3 grocery chains, good restaurants, & fun entertainment. A few restaurants: 15 minutes to 2 established, locally owned & operated steak houses, Clarksville Station Steak House & Old Country Club Steak House; fine dining: 30 minutes to South Boston, Va to Bistro 1888, locally owned & operated & true Virginian hospitality with a AAA 3 Diamond rating; Italian: 15 minutes to Vesuvios Italian near Walmart or Vesuvios ll Food & Sports Bar downtown; need it quickly: 5 minutes to Mayo Marina (Country) Grill & Store for breakfast, burgers, spicy loaded pizza, & home-made fried pies (eat-in or take-out); great, hot or cold subs: 15 minutes to American Hero for philly cheese steak or gyro. Some entertainment: Out your front door down a gentle slope to swim, sun, watch the sunset, & fish for bass & crappie off your dock in clean, clear, pristine Mayo Lake; bring your fishing/ski boat & moor it safely to our PBD (pontoon boat dock); ski, wakeboard, & tube in one of the most uncrowded lakes you've ever been to; or, rent a canoe or kayak from Mayo Park; 5 minutes to Mayo Park (walking trails; bands, movies, & plays at the Amphitheatre; free boat launch; playground); 15 minutes to Palace Pointe (all under one roof) Family Entertainment (20 bowling lanes, 7 billiards tables, video arcade, rollerskating, 8 movie theatres, & food diner); 30 minutes to Orange County Speedway or South Boston Motor Speedway or to Virginia International Raceway (VIR = Lemans-type pro & amateur sports car & motorcycle road race course). For driving times to many other awesome activities, please see the 'Other Activities' Section under the 'Features & Amenties' Heading below. Please feel free to contact us about any rental question or particular activities you're interested in. We'll do our best. 'We aim to please'!! 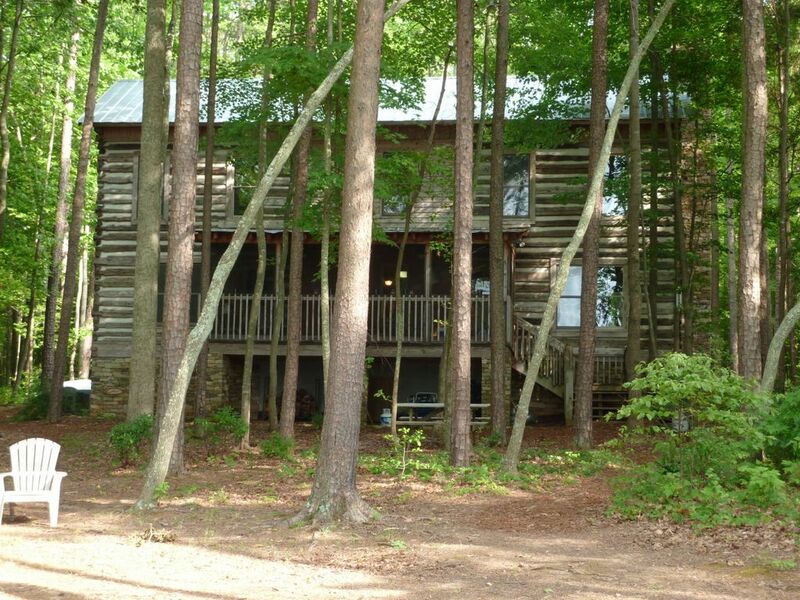 Keywords: Secluded, 4BR, Lakefront, Log Cabin Home, 1st floor master, wireless hi-speed internet, pet friendly, large panoramic lake view, excellent fishing, Mayo Lake, NC, Person County, NC, Roxboro, NC, lodging for (40 minutes) Duke University Hospital, lodging for (30 minutes) VIR, lodging for (35 minutes) Durham, NC. Kathy & I are small business owners. We have worked together since our 1st child was born in 1986. I'm a 'think outside the box', special projects kinda person, & Kathy is a gifted manager. She is easy to talk to & enthusiastic. We would be nowhere without her. We struggled with this cabin's construction, our dream lake home. Piecing 3 old log cabins into one new house was so much more expensive than we'd ever imagined. Truly, we were sick towards its completion because we thought as soon as it was finished, we would have to sell it. A friend suggested we try to rent the cabin before making the selling decision. We were doubtful, but gave it a try. An aunt happen to tell us about vrbo, & it rented incredibly well. We knew then that this peaceful 'walk in the past' cabin was meant to be shared with others & here we are today. Please come unwind & recharge. There's no other fresh water lake like Mayo Lake within the 3 states of lakes we've visited. Regulations say the shoreline must stay in its original, natural state. You can moor a boat to the shore, but no floating or permanent docks are allowed. This keeps development down because so many people desire a permanent dock. Mayo Lake's water is so clean, so clear. On a calm day, the emerald green water allows you to see 4' below the surface. Have you ever been to a very clean lake, but the water was still dark? I'm sure you have. Mayo Lake is not like that, unless it's an unusually busy, windy day. Being busy people, when we pass by the last house on the right on Gabriel Jones Road & enter the 'tunnel created by trees', our unique benefit is we begin to relax & enjoy the quiet, un-busy forest. We've worked hard at our jobs, & it's now time to have some family fun. We wake up the next morning, see the beautiful old square logs & old timey chinking around us, & lay there trying to grasp 'could this be our place'. If possible, we open the windows, turn on the ceiling fans, & enjoy the fresh air & any forest activity. The kids get the boat ready. For our family wakeboarding, tubing, & skiing has become a way for our family to take our 'world switch' to the next level. We board, tube, ski, lounge, snack, & cheer each other on as we play. We watch Kathy ride behind the boat on her slalom ski & try to guess what song she's singing out loud like a little girl. We just have family fun. 'Eid dont git no bet-tah din dis'! Come on!! Very expansive lakefront view; no other house in sight in any direction; pontoon boat dock with mooring whips to moor your fishing/ski boat. Side by side with ice/water dispenser in door. Also Dishwasher, Disposal, & Microwave. upstairs TV set-up for movie-watching and gaming, not hooked up to satellite tv. My family and I had a wonderful Thanksgiving week at your cabin. The lake view was awesome and the family pictures we took will be treasured for ever. We rented Kayaks from Lake Mayo Park and really enjoyed Kayaking on the lake. I look forward to staying at your beautiful log cabin again. Thank you so much. Perfect weekend getaway from Durham! My husband and I rented the log cabin for a weekend away from our young children, and couldn't have found a better spot to relax and enjoy being together. The weather was cold, but we "hiked" out to the end of the peninsula one afternoon and watched the sunset from the floating dock another evening, and enjoyed the view of the lake from the house at all times. The deep stone fireplace, the board games, the comfortable furniture, and the well-stocked kitchen made for a comfortable stay, and the beauty of the cabin itself and the surrounding environs made for a memorable one. We hope to bring the kids back here when the weather gets warmer; we know they'd love it, and it's such a pretty and easy drive from Durham. We had a lovely, lake-filled weekend at a beautiful, one-of-a kind log house. The owners, Arch and Kathy, were so attentive and responsive to any questions. It was just what we needed - to be out of traffic and into calm. The cabin has everything needed to have a relaxing vacation. We enjoyed our stay at Cornerstone Cabin last week. Well appointed, nicely decorated rustic cabin in a convenient but remote location. 5 minutes to boat ramp but very little boat traffic on the lake. If heaven is a place, this is it. We just spent almost a month at the Cornerstone Cabin. It is at the end of a well maintained gravel road and ther you come upon the house and the incredible view of Mayo Lake. Kathy and Arch have anticipated every need. The house is decorated with antique furniture, quilts, samplers....it is simply and beautifully appointed. The screened porch looks out on the lake and is a perfect spot for a cup of coffee, breakfast, dinner....all the while hearing the birds sing and watching the pristine lake. The beds are comfortable, the air conditioning helps on a hot day, the tv gets good reception if you don’t have a book to read. Be sure to sit by the shore to watch the sun set. The town of Roxboro is small but has what you might need...including a theater which shows 8 different films. The people in all the stores are gracious hosts and happy to direct you to what you need. Mayo Lake Park has some easy hiking trails of varying lengths for any kind of hiker. Kathy is quick to respond to any question and we felt at home as soon as we walked onto the cedar steps. We were sorry to leave and hope to return someday. 5 minutes to Mayo Park (amphitheatre, walking trails, free boat launch, wildlife viewing, playground, canoe & kayak rentals), fishing from floating dock or your boat, water Sports (if you have a boat)lots of calm water, 15 minutes to Roxboro Country Club golf, 15 minutes to Palace Pointe Family Entertainment (Video Arcade, 20 Bowling Lanes, rollerskating, 7 Billiards tables, 8 Movie Theatres, Food Diner), 10 minutes to Person County Museum, wonderful plantation tours, museums, & antique shops within an hour's drive, 65 minutes to Carolina Hurricanes Hockey, 35 minutes to Durham Bulls minor league Baseball family fun, 55 minutes to UNC, 40 minutes to Duke University & Hospital, 70 minutes to NC State University, RBC Center, CASL Soccer Complex, USA Baseball Nat'l Training Center, WakeMed Soccer Stadium, 30 minutes to Virginia Int'l Raceway(VIR) Pro & Amateur LeMans-type road races, centrally located for shopping NC & Va colleges.